Give your child's bedroom stylish storage when you add any Little Seeds Fabric Bin to the mix. 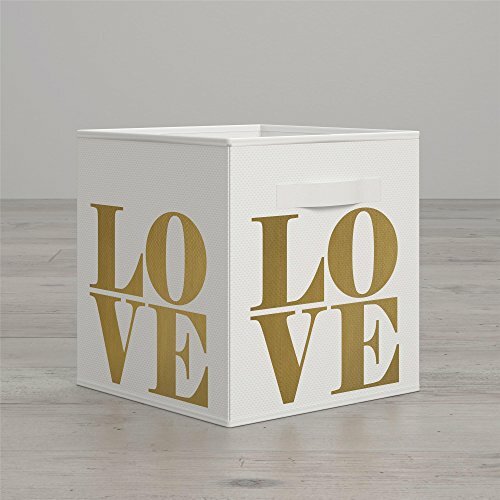 The adorable LOVE pattern is placed on all four sides of the bin in an eye-catching gold. This lightweight bin design lets your child move toys, books, art supplies and more with ease and slides right into the Rowan Valley 6 Cube Organizer. Like all Little Seeds products, this purchase helps support a major environmental initiative. Discover how this can help you and your child involve your community in habitat rebuilding. Expand your collection by mixing and matching with other Little Seeds collections to create a one-of-a-kind space for your child. This lightweight bin design lets your child move toys, books, art supplies and more with ease and slides right into the Rowan Valley 6 Cube Organizer. Like all Little Seeds products, this purchase helps support a major environmental initiative.